To coincide with the release of the second series, a TV tie-in book was commission, to be written by BAFTA award winning writer Heidi Thomas, the writer of the series. Working closely with Harper Collins and Neal St Productions, we were commissioned to design the book, including much of the behind-the-scenes photography. Commissioned by The Architecture Foundation for Brent Council and Design for London, New Windows on Willesden Green was an Outer London Fund project to regenerate Willesden High Road through an advent calendar of shop windows. Partnered with “Glorious Beginnings”, a children's Christian bookshop, our aim was to push the project beyond window displays and transform the entire shop front. 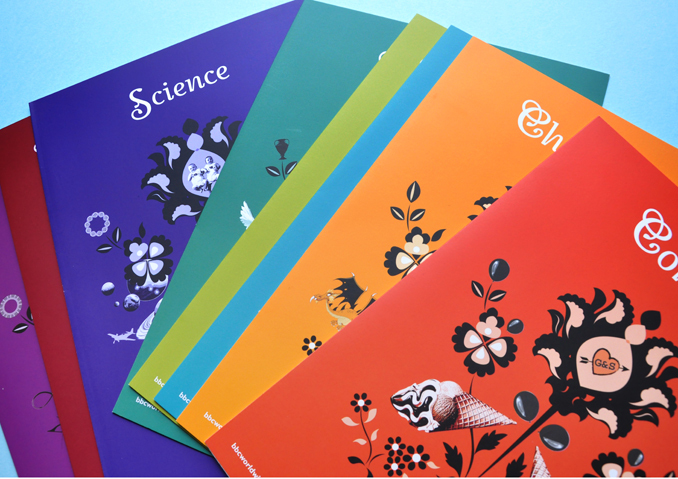 In 2012, Harper Collins publisher asked us to take part Project Evolution – A Brief for Well Designed Books. Taking A Land by Jacquetta Hawkes as the case study, we were asked to research every aspect of the book design. A Land is a classic interpretation of regional culture based on the landscape and the underlying geology of the British Isles. BBC Worldwide host a yearly conference taking over the whole of the Brighton Centre. The theme for 2010 was “The World’s Storyteller” and Laura Middlehurst art directed and designed all graphic elements, including; branding, catalogues, brochures, promos, screens, wall graphics and branded notebooks. The Mill. Co Project is a creative social enterprise, based in East London, offering affordable workspace for creatives. We Are Laura created the brand identity, website, external and internal signage and all marketing materials for the events and exhibitions. The identity represents different parties coming together to create something new. Commissioned by The Co-operative, in conjunction with Mill Co., we produced a print in celebration of Co-operatives United. The design was based on a set of cogs, working together. Each cog is made from an element of The Co-operative’s businesses; finance, food, agriculture, fishing, community, housing and transport. The print was applied to t-shirts and bags for the 2012 International Year of the Co-operatives conference. Foodari provide a home delivery service for locally sourced produce. We were commissioned to produce a set of flyers to communicate the directness and freshness of the produce. The flyers depict parcels of freshly picked produce as though they have been posted straight from the farmer.